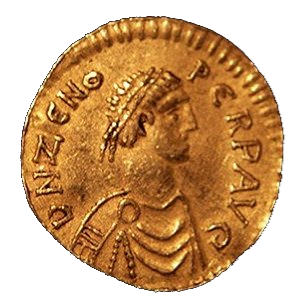 Flavius Zeno Augustus - originally named Tarasis Kodisa Rousombladadiotes - was Emperor of the East from 474 to 475 and again from 476 to 491. Domestic revolts and religious dissension plagued his reign, which nevertheless succeeded to some extent in foreign issues. His reign saw the end of the Western Roman Empire under Romulus Augustus, but he contributed much to stabilizing the eastern Empire. Zeno died on 9 April 491 of dysentery or epilepsy, after ruling for 17 years and 2 months. He was succeeded by Anastasius I - the first Emperor ruling in the East without a western counterpart.